ARRIVE AUCKLAND, NEW ZEALAND. Kia ora and welcome to New Zealand! Hotel rooms are available for immediate check-in. The remainder of the day is yours to relax or start exploring. AUCKLAND. This morning begins with a welcome briefing to meet fellow passengers and your Tour Director. Then enjoy a sightseeing tour, discovering first-hand why Auckland is regarded as one of the best places in the world to live. See the Domain, the city’s oldest park, developed around an extinct volcano. Highlights also include charming Parnell Village, bustling Queens Street, and the Viaduct Harbour. The remainder of the day is at your leisure. You may wish to take a trip to the top of Sky Tower, enjoy a sailing experience on Auckland Harbour, or visit nearby picturesque Waiheke Island. Your Tour Director will have suggestions for additional sightseeing, shopping, and dining. AUCKLAND–ROTORUA. Leave Auckland this morning and journey through lush farm land to Rotorua, home to New Zealand’s Maori culture and geothermal wonders. Our first stop is TE PUIA where a guided tour allows you to see bubbling mud, pools of boiling water, and the famous Pohutu geyser, the largest active geyser in the southern hemisphere. You’ll also have a chance to witness traditional Maori carving and weaving along with a Maori cultural performance. Then, visit AGRODOME to learn more about one of the country’s major industries—sheep! This evening is at leisure. ROTORUA. Today is free to explore more of Rotorua. You may wish to take an optional excursion to visit magical Hobbiton, the set used as the Shire in the movie trilogies, The Lord of the Rings and The Hobbit. Other options include a zipline and canopy tour, helicopter and floatplane flights over the volcanic valley, or relaxing in a natural hot spring at the Polynesian Spa. In the evening, you may want to attend an optional Maori Hangi dinner and cultural performance. ROTORUA–LAKE TAUPO–NAPIER. Today we continue our journey on the north island traveling past Lake Taupo, New Zealand’s largest lake. This afternoon, arrive in Napier, located in the beautiful Hawk’s Bay region. This afternoon, a WALKING TOUR explains how a natural disaster resulted in Napier becoming one of the purest Art Deco cities in the world. With the rest of the day at leisure, you may wish to take a stroll on the beach, shop for a favorite souvenir, or visit the National Aquarium to see sharks, stingrays, penguins, and more. NAPIER–WELLINGTON. Continue to Wellington, New Zealand’s capital city known for is vibrant art scene, world-class restaurant culture, and active outdoor lifestyle. Upon arrival, a sightseeing tour includes the famous Beehive and Parliament building and panoramic views of the city and harbor from the top of Mount Victoria. 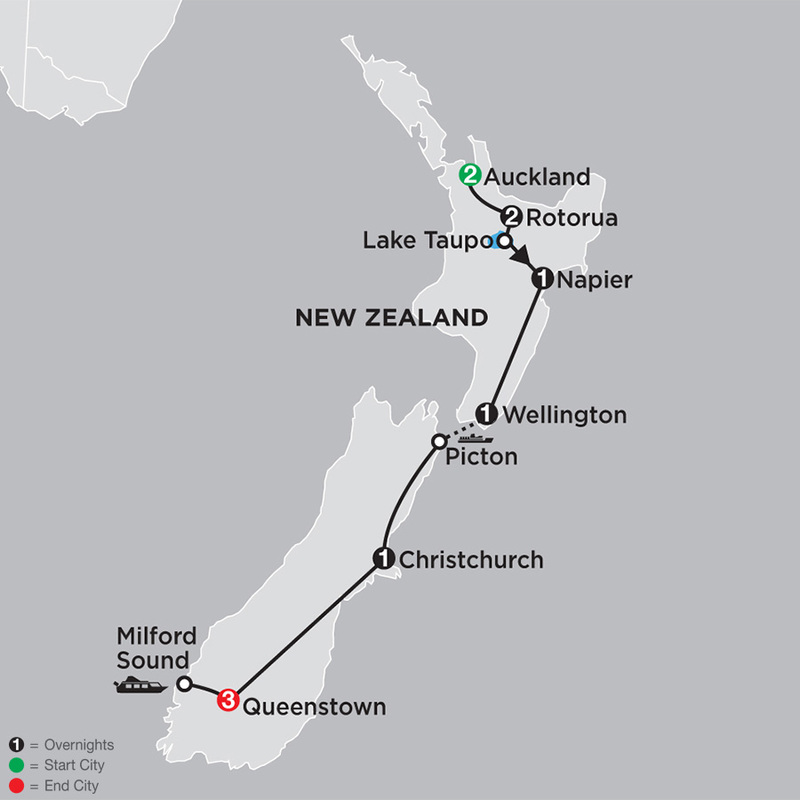 WELLINGTON–INTERISLANDER FERRY–PICTON–CHRISTCHURCH. Today, enjoy a special treat as you sail from Wellington to Picton and enjoy the spectacular Marlborough Sound on one of the most scenic FERRY journeys in the world. Make sure to have your camera ready as dolphins are frequent traveling companions of the ferry. On occasion, you might even spot a pod of whales or some penguins swimming by. Continue to Christchurch, the largest city on the South IsIand for an overnight stay. CHRISTCHURCH–QUEENSTOWN. Our journey continues across New Zealand’s south island today. This is the land of towering mountains, rugged coastlines, and sweeping plains. Later, arrive in Queenstown, the “Adventure Capital” for a 3-night stay. This evening you may want to take the Skyline Gondola to the top of Bob’s Peak, where you’ll enjoy breath-taking views of Queenstown and Lake Wakatipu below. QUEENSTOWN. Today is free to explore more of Queenstown on your own. You may want to take the historic TSS Earnslaw Steamship to Walter Peak Farm for a delicious lunch or dinner, discover a favorite boutique or art gallery, take an exciting helicopter ride over the Remarkables Mountains, or enjoy a wine tour. QUEENSTOWN. EXURSION TO MILFORD SOUND. Today, travel to breathtaking Milford Sound and enjoy a CRUISE to see cascading waterfalls, sheer cliff walls, tropical rainforest, wildlife including seals and dolphins, and fantastic scenery. It’s sure to be a highlight of your trip! Return to Queenstown this evening. QUEENSTOWN. Your vacation ends this morning. "I feel very lucky to live here and privileged to share my home with visitors from around the world. We have such unique and pristine environments, it thrills me to see how people react to the wonderful and diverse landscapes as well as the activities and experiences that they can have here. Between Australia and New Zealand, we have it all. I love my job and showcasing this remarkable part of the world, its culture, and history. It brings me great satisfaction knowing our guests return home with magical memories that we have helped create is its own reward."